1 2016-12-07T15:03:09+00:00 A Battle! A Battle! 3 two editions gallery 2018-02-12T01:08:24+00:00 1764 Pemberton, Israel, 1715-1779 Reference editions. Two editions: original and extended. 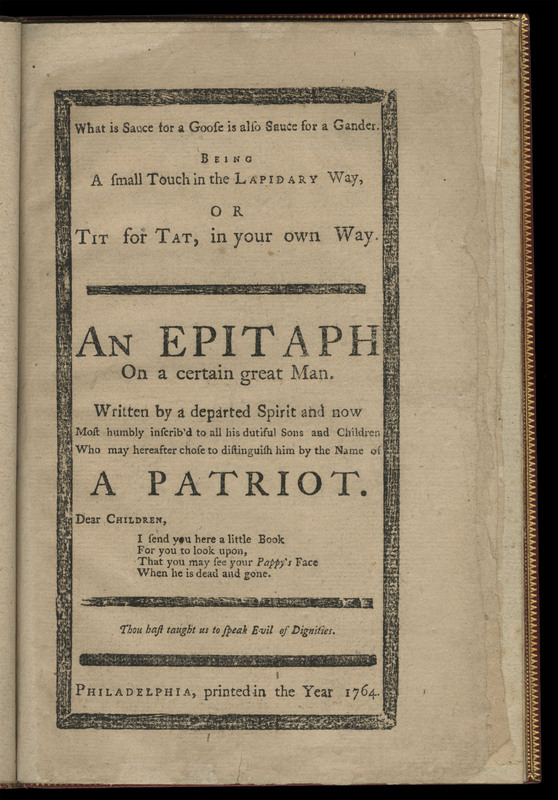 Original edition from Library Company of Philadelphia. Extended from American Philosophical Society. 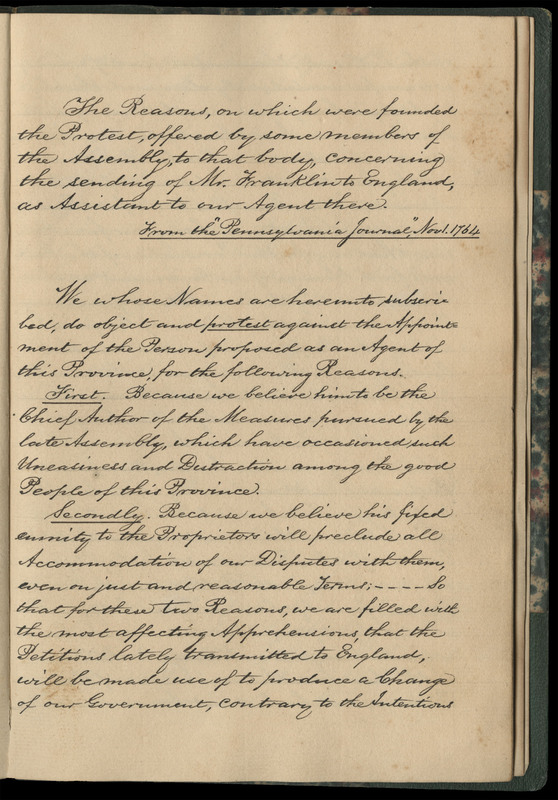 1 2016-08-19T17:52:53+00:00 A Declaration and Remonstrance 3 (three editions) image_header 2018-08-15T17:14:16+00:00 1764 Smith, Matthew. Reference editions. Two editions: original and German translation. Historical Society of Pennsylvania. 1 2016-08-19T17:00:47+00:00 An Historical Account of the Late Disturbance 2 (two editions) image_header 2018-02-12T01:22:49+00:00 1764 Well wisher. Reference editions. Two editions: original and reprinted. 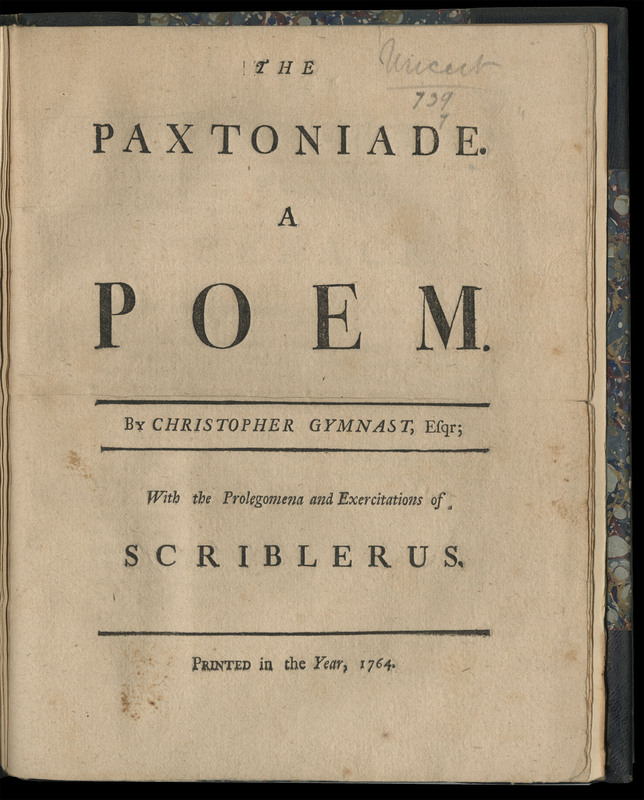 Original edition from Library Company of Philadelphia. 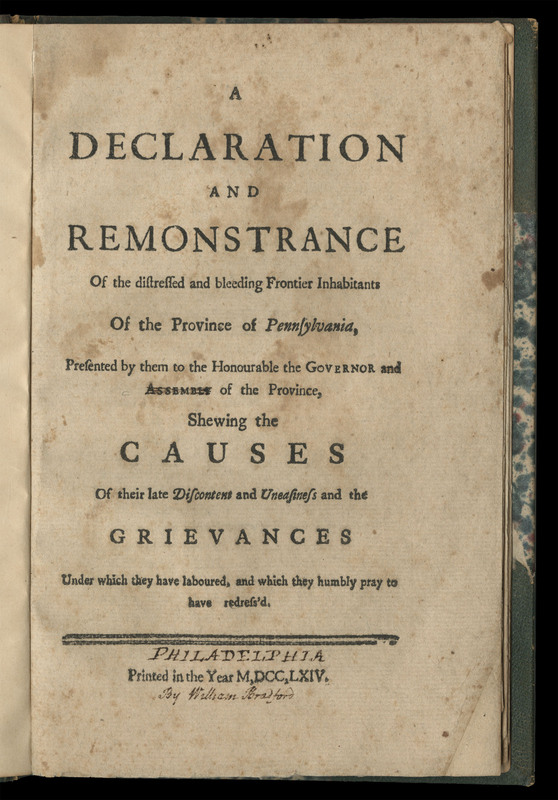 Reprinted from Historical Society of Pennsylvania. 1 2016-08-19T15:06:26+00:00 A Letter From Batista Angeloni 3 (two editions) image_header 2018-02-12T01:28:28+00:00 1764 Shebbeare, John, 1709-1788. Reference editions. Two editions: original and reprinted. Library Company of Philadelphia. 1 2016-08-19T14:42:06+00:00 A Looking-Glass for Presbyterians 2 (two editions) image_header 2018-02-12T01:34:55+00:00 1764 Hunt, Isaac, approximately 1742-1809. Reference editions. Two editions: Numb I. and expanded. Historical Society of Pennsylvania. 1 2016-08-19T13:42:24+00:00 A Narrative of the Late Massacres 3 (four editions) image_header 2018-08-15T17:12:52+00:00 1764. Franklin, Benjamin, 1706-1790. Reference editions. Three editions: original, inscribed, and German translation. Original and German translation from Historical Society of Pennsylvania; inscribed from Library Company of Philadelphia. 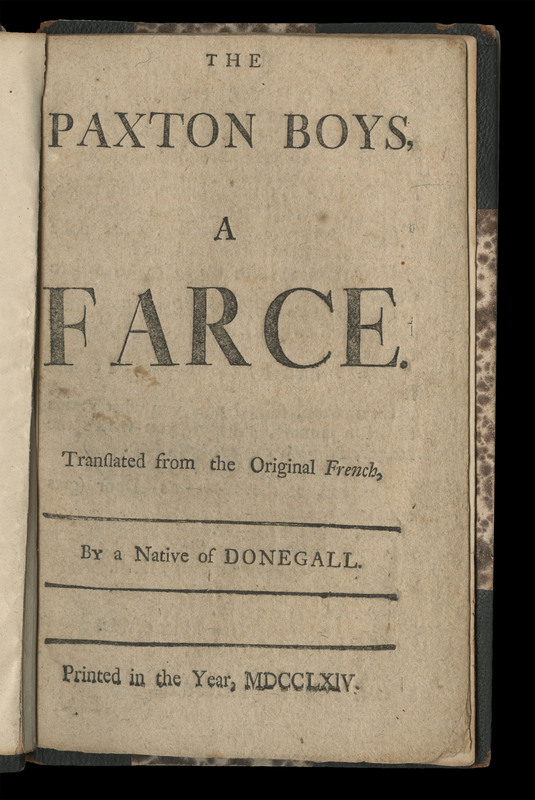 1 2016-08-19T17:16:56+00:00 The Paxton Boys: a Farce 2 (two editions) image_header 2018-02-12T01:50:56+00:00 1764. A native of Donegall. Reference editions. Two editions: first and second edition. 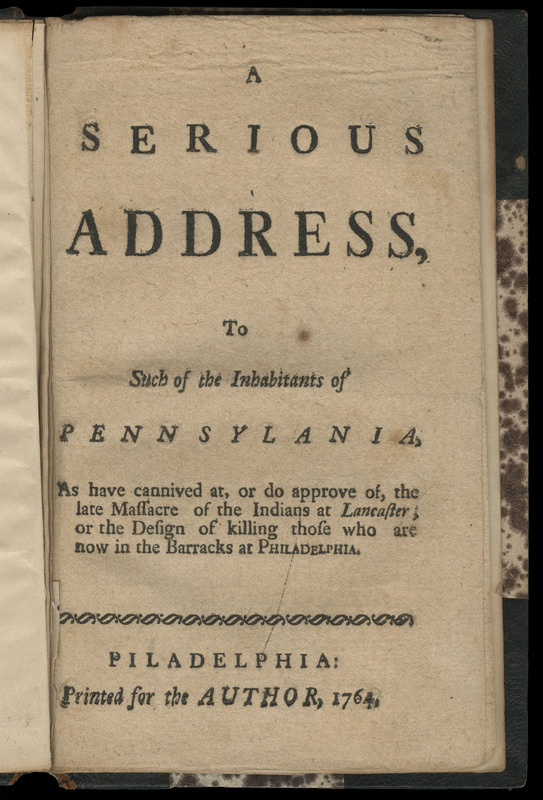 First edition from Historical Society of Pennsylvania. 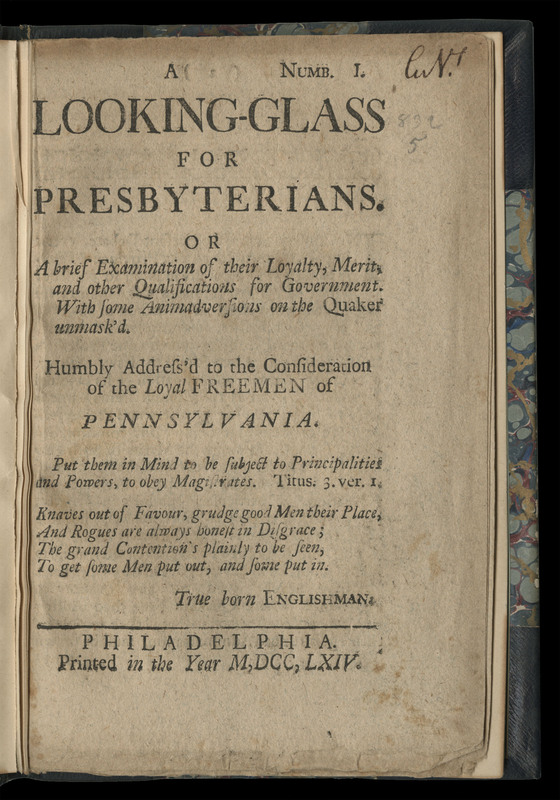 Second edition from Library Company of Philadelphia. 1 2016-08-19T13:57:28+00:00 The Paxtoniade 2 (two editions) image_header 2018-02-12T01:52:57+00:00 1764. Gymnast, Christopher. Reference editions. Two editions: first and second edition. 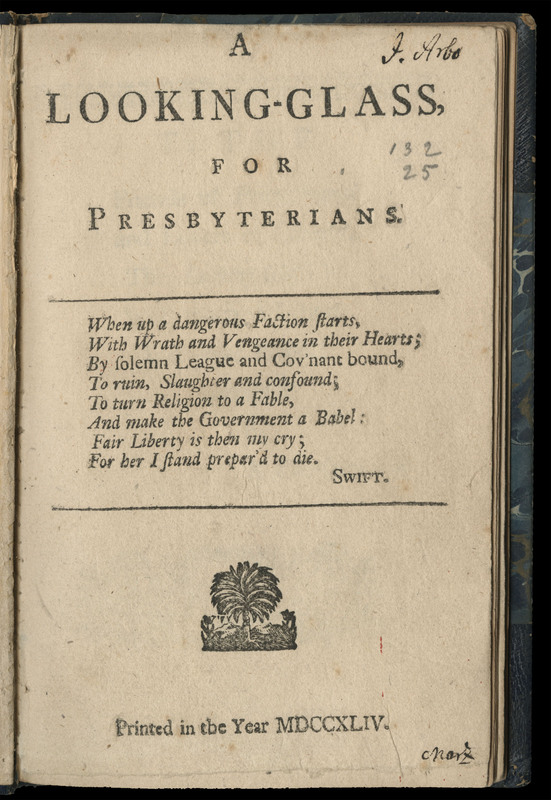 First edition from Historical Society of Pennsylvania. 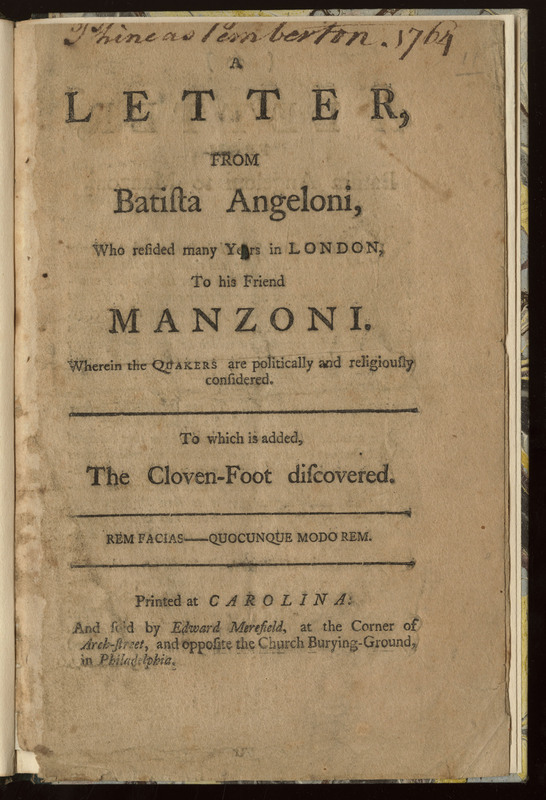 Second edition from Library Company of Philadelphia. 1 2016-08-19T17:11:40+00:00 The Plain Dealer 2 Numb. I, Numb. II, and Numb. III image_header 2018-02-12T02:10:09+00:00 1764. Williamson, Hugh, 1735-1819. Reference editions. Three editions: Numb I, II, and III. Library Company of Philadelphia. 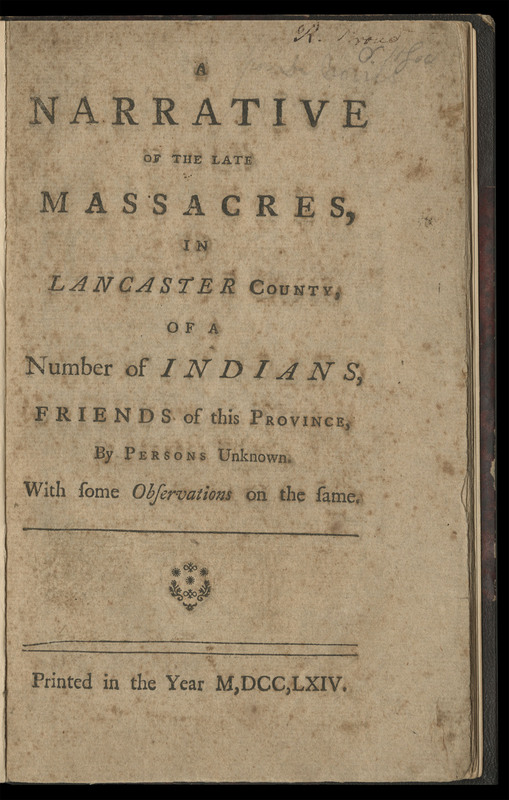 1 2017-06-28T09:26:22+00:00 The Quakers Assisting to Preserve the Lives of the Indians 2 (multiple editions) gallery 2018-02-12T02:12:38+00:00 1764. Philanthropos. Reference editions. Two editions: original and No. II. Library Company of Philadelphia. 1 2016-08-19T13:31:01+00:00 The Quaker Unmasked 3 (two editions) image_header 2018-02-12T02:17:59+00:00 1764. Dove, David James, 1696?-1769. Reference editions. Two editions: first and second edition. Library Company of Philadelphia. 1 2016-08-19T13:49:14+00:00 Remarks on a Late Protest Against the Appointment of Mr. Franklin 2 (two editions) image_header 2018-02-12T02:26:04+00:00 1764. Franklin, Benjamin, 1706-1790. Reference editions. Two editions: manuscript and German broadside. Historical Society of Pennsylvania. 1 2016-08-19T17:25:00+00:00 A Serious Address 3 (three editions) image_header 2018-02-12T02:33:09+00:00 1764. A Pennsylvanian. Reference editions. Three editions: first, second, and fourth. 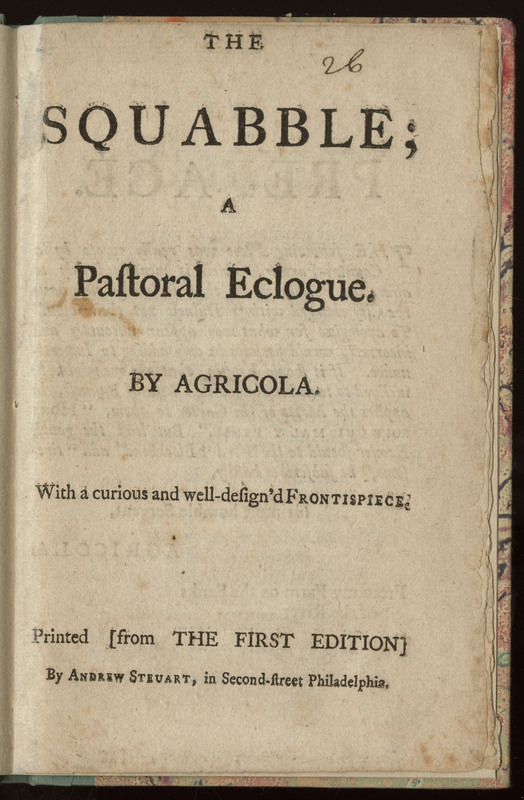 First edition at Historical Society of Pennsylvania. 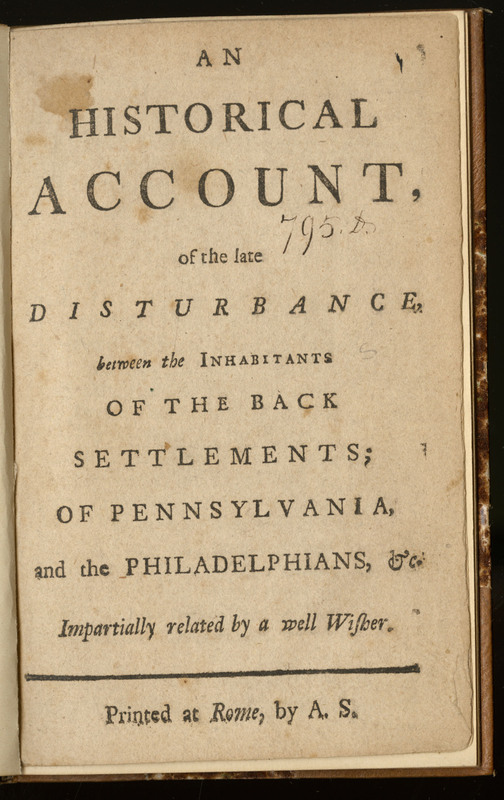 Second and fourth edition at Library Company of Philadelphia. 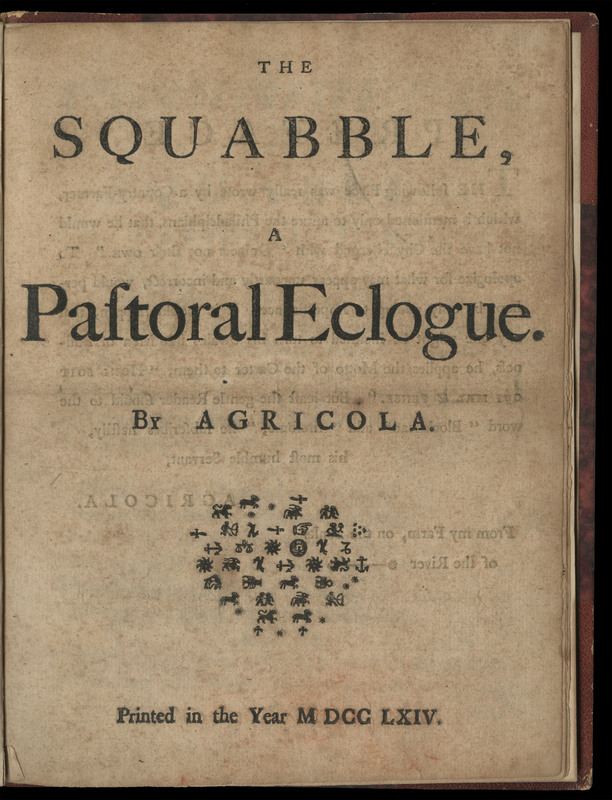 1 2016-08-19T13:14:35+00:00 The Squabble 3 (three editions) image_header 2018-02-12T02:36:22+00:00 1764. Agricola. Reference editions. Three editions: first, second, and third. 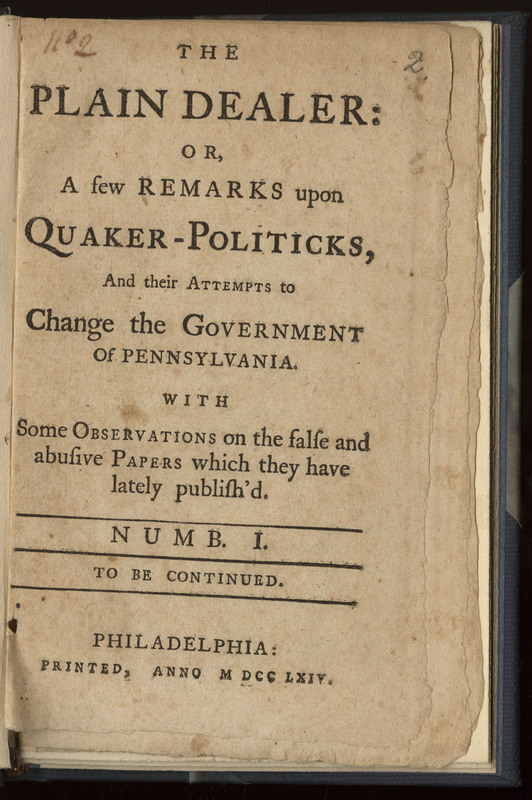 First and second edition at Historical Society of Pennsylvania. Third edition at Library Company of Philadelphia. 1 2016-08-19T17:06:11+00:00 What is Sauce for a Goose is also Sauce for a Gander 2 (two editions) image_header 2018-02-12T02:46:08+00:00 1764. Williamson, Hugh, 1735-1819. Reference editions. Two editions: longer edition resides at Library Company of Philadelphia. 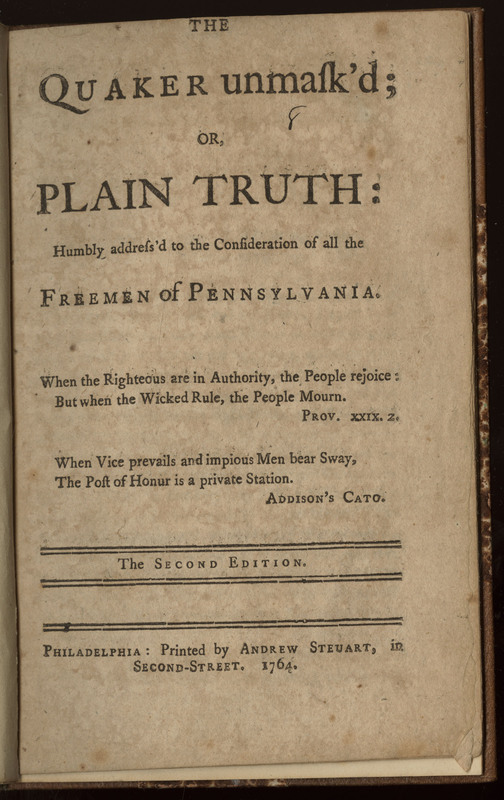 Shorter edition at Historical Society of Pennsylvania. Longer edition at Library Company of Philadelphia.